HE is known as one of the food industry’s white knights, riding into towns across the country to wade through bad book-keeping and chaotic kitchens in his one-man mission to sort out Britain’s restaurants. But now celebrity chef Gordon Ramsay, star of TV’s Kitchen Nightmares, has swooped on a business closer to home. The Michelin-starred chef’s company Gordon Ramsay Holdings Limited has bought the York and Albany pub in Parkway, Camden Town, it was confirmed yesterday (Wednesday). It is thought it has cost him around £4 million. One of his leading proteges, Angela Hartnett, formerly head chef at Mayfair hotel’s The Connaught, will be at the helm. It will also be a hotel with 10 luxury rooms. Ms Hartnett, who specialises in Italian food, will open the restaurant – to be known as York and Albany – in May. The spokeswoman said the extensive bar in the building would be a “traditional London bar”. 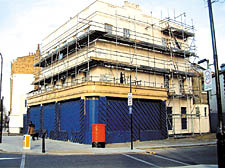 The Grade II-listed building has been boarded up for several years. Previous owner actor Gary Love spent £2 million buying the York and Albany freehold from the Crown Estate in 2006 and a further £1.8 million renovating it. Mr Love told the New Journal last year he had removed the carcasses of thousands of dead birds before shoring up the building, which he said was so damaged it was in danger of falling down. The pub, which opened in 1827, was designed and built by Regent’s Park architect John Nash and named after his friend the Duke of York and Albany.